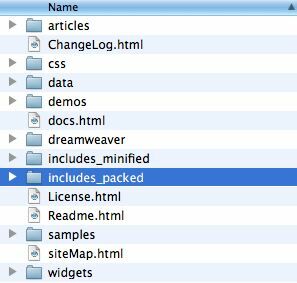 Now, head over to your Dreamweaver configuration folder – making sure that Dreamweaver is closed. It’s exact location will depend upon the platform that you are on. On a Mac, its default location is Applications>Dreamweaver CS4>configuration. On a PC, you should find it in User/AppData/Local/Adobe/DreamweaverCS4/Configuration. Locate the Shared folder, and inside, open the Spry folder. 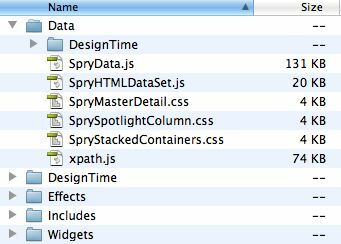 Here you’ll find three files which can be replaced, SpryData.js, SpryHTMLDataSet.js and xpath.js. Notice the difference in size between the originals and the versions from the packed folder. 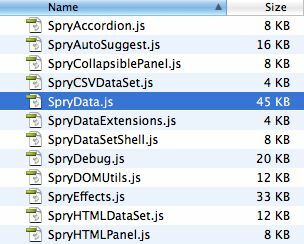 SpryData.js is 131 Kb versus 45 Kb in its packed form. If you want to make a backup of the files which you are about to replace, feel free to move them or rename them. Once again, I hope this helps…Depending upon what elements of the framework you are using, you can save anywhere from a few Kilobytes, all the way up to just over 200 Kb. Happy coding! What I would suggest is using the minified files instead. They might be larger in file size. But combined with proper gzip headers on your server “just” as small. With out an extra overhead. @V1 – Excellent point. And, of course, those minified versions are available in the framework download as well. I’ll update the post inline.